Ronaldinho won the UEFA Champions League with Barcelona in 2006. 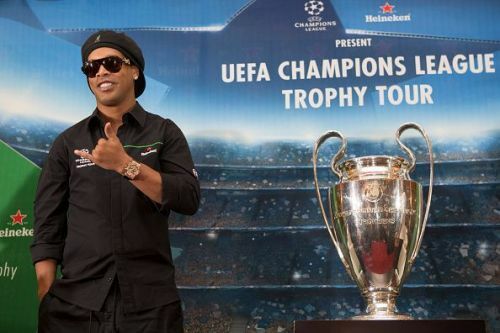 Ronaldinho, one of the greatest player of his generation, if not all time, believes that Premier League outfit Manchester United shouldn't be ruled out of contention for a semi-finals spot in the UEFA Champions League, despite them trailing Barcelona by one goal from the opening tie of their QF fixture at Old Trafford last week. Speaking to Jeremy Cross of Daily Star, the 2005 Ballon d'Or winner stated that a one goal lead is too narrow to be considered decisive and predicts that whichever team scores the first goal at the Nou Camp, will be in commanding position to book a place in the last four. Ronaldinho, who played for PSG, Milan and Barcelona in his trophy-laden career, came very close to joining the Red Devils under Sir Alex Ferguson in 2003, but he opted for the Catalan giants instead and the rest is history. Till date, he remains one of the biggest stars of the sports to have rejected a move to the English top-flight. Barcelona have gone 30 home games in Europe without losing and are strong favourites to beat United at Nou Camp, which has become a fortress for them in recent times. The 39-year-old, who retired from professional football in January last year, is now back at the LaLiga club, after a period of ten years, having agreed to join them as an Ambassador last December, to represent the Spanish club at various institutional events. “The truth is that Barcelona should have finished the game in Manchester - but at just 1-0 Manchester United will still believe that are in this tie." “I see them[Barcelona] even winning comfortably in Barcelona. It will all be on the first goal. Manchester United won their latest league fixture and will be heading into the daunting away trip to Barcelona with a much needed boost. But, it remains to be seen, whether Ole Gunnar Solskjaer's men overcome the challenge or Lionel Messi and co. leave them in the dust.